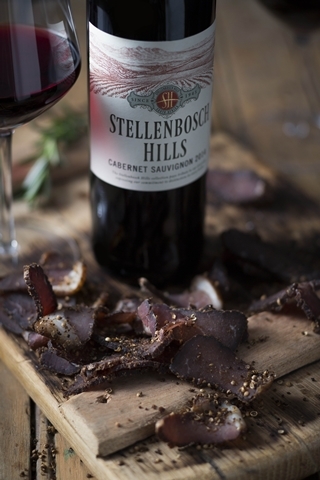 These days wine is matched with everything from cheese to chocolate, but a first in South Africa is the Stellenbosch Hills ‘Biltong & Droëwors Adventure’. We started this pairing in 2005 and it is still ever so popular. “Winemaking in South Africa dates back to 1659, and the making of dried meat products just as far back,” explain cellar master, P.G. Slabbert. It seemed a logical ‘local is lekker’ match to bring these two products together for a unique tasting experience that celebrates our Cape heritage.” This unique pairing of six Stellenbosch Hills premium wines with specially selected cured and dried meats is a must! The tasting costs R75 per person and takes between 30 minutes to an hour. Last biltong tasting to commence 45 mins before closing time. Book at info@stellenbosch-hills.co.za or call +27 (0)21 881 3828. With dry, lean meat and boasting a pleasant gaminess this Springbok biltong is perfectly balanced by the sumptuous citrus fruit, and buttered toast flavours found in the Stellenbosch Hills 1707 Reserve White. Kudu meat is one of the tastiest types of game. The subtle flavours of this premium, dried sausage creates the perfect match for the silky tannin structure of the Cabernet, which also boasts with pleasing notes of ripe black fruit. This milder game meat is complemented by the plummy, ripe fruit flavours of the well-rounded Stellenbosch Hills Merlot. A shorter drying out period results in a pleasantly succulent, flavourful and juicier meat with a complex taste, perfectly complemented by the sweeter notes of this Pinotage/Merlot blend. A unique oak smoked and cured biltong, made from finest beef and gently spiced. Smoked meat flavours prominent in the Stellenbosch Hills Shiraz, which also exhibits a hint of dark chocolate, perfectly complements this succulent beef, exposing its natural sweetness. Immaculately cured and spiced, this droëwors is made from the finest quality free-range beef. Roasted coriander adds an exotic zest, offsetting the clean spice flavours and ripe tannins characteristic of the famed Stellenbosch Hills 1707 Reserve.